Startup founders dream of becoming the next Airbnb or Uber, but the harsh reality is that most startups don’t end with a success story. The silver lining is that failed startups serve as cautionary tales for entrepreneurs. Much can be learned from why others didn’t succeed. We looked at the stories of 193 failed startupsto extract the lessons from their demise. To find the patterns behind why these startups failed, we analyzed postmortem essays written by the founders as well as press coverage about the shut downs. One issue didn’t emerge as the primary cause of startup failure, but rather most startups pointed to a combination of reasons. This is likely due to certain issues being symptoms of another issue. If your business model isn’t sustainable or profitable, you’ll blow through cash quickly. Without money, you can’t grow. If you don’t show signs of growth, it becomes difficult to get funding … and so on. Good Idea, Bad Business. 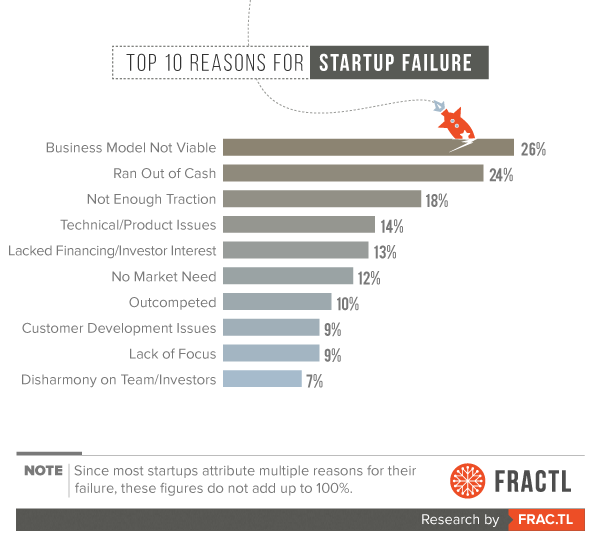 More than a quarter of startups pointed to a weak business model as a reason they failed. As Vitoto founder Vinay Patankar wrote, a good idea but bad business was a primary reason for his startup’s shutdown. No matter how brilliant the idea, if you can’t make it profitable or scalable, you won’t have a successful business. Not Enough Money. Twenty-four percent of startups said that running out of money contributed to failure, while another 13% struggled to get financing. Cash is king for startups. Even a successful business model will fail without proper cash flow. To further illustrate how most startups went out of business due to several issues, we created an interactive network model that groups startups together according to their common reasons for failure. In this graph, each node represents a startup or reason for failure. The lines represent connections between nodes, so when two startups are connected by a line it means they have one or more reasons for failure in common. Click on each node to see more information, such as whether or not the startup had funding (and how much) and a link to the story about why the startup failed. You can also view the full graph here. These groupings show how the culmination of multiple things going wrong may contribute to a startup’s demise. However, some singular reasons, such as legal challenges or no market need, can be enough to cause a startup to go under. Funded Startups vs. Unfunded Startups: More Money, More Problems? More than three-quarters (76%) of the startups we analyzed had some degree of funding, ranging from $10,000 to $850 million. 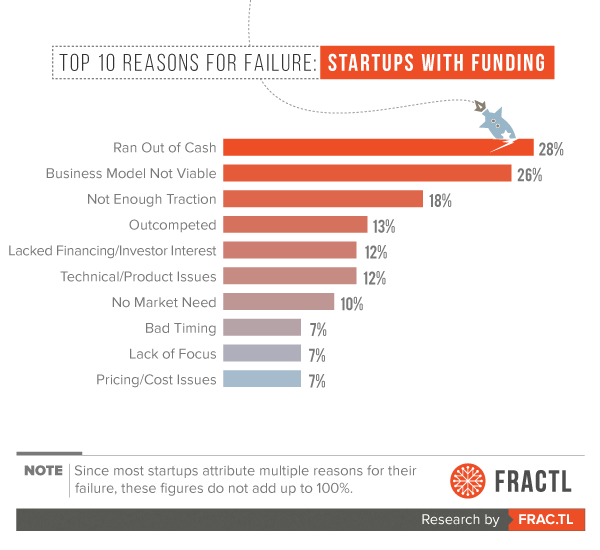 Surprisingly, money-related issues were the most common reasons the funded startups failed, with a combined 40% citing running out of cash or a lack of funding as a reason for failure. On the other hand, only 28% of startups without funding blamed a lack of funding or running out of cash for their shutdown. More than a quarter (26%) of unfunded startups blamed a poor business model, while 17% cited customer development issues, a lack of funding, and no market need as reasons they failed. Three issues that didn’t crack the top 10 for funded startups but were cited by the unfunded startups were customer development issues, disharmony on the team, and inexperience. 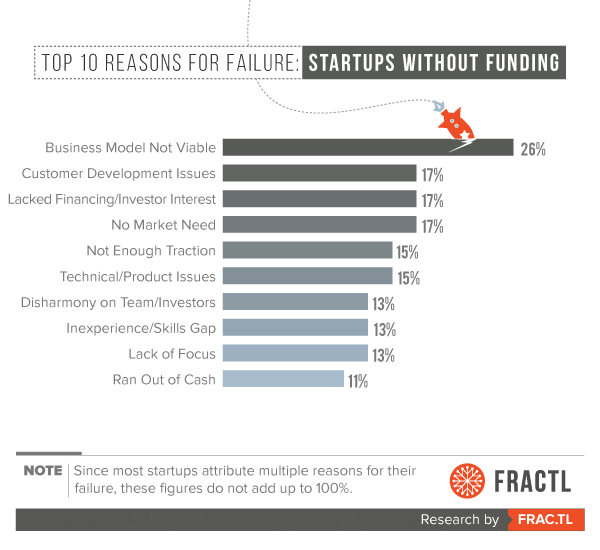 Unlike the funded startups, the startups-without-funding’s top 10 reasons for failure did not include being outcompeted, pricing issues, or bad timing. 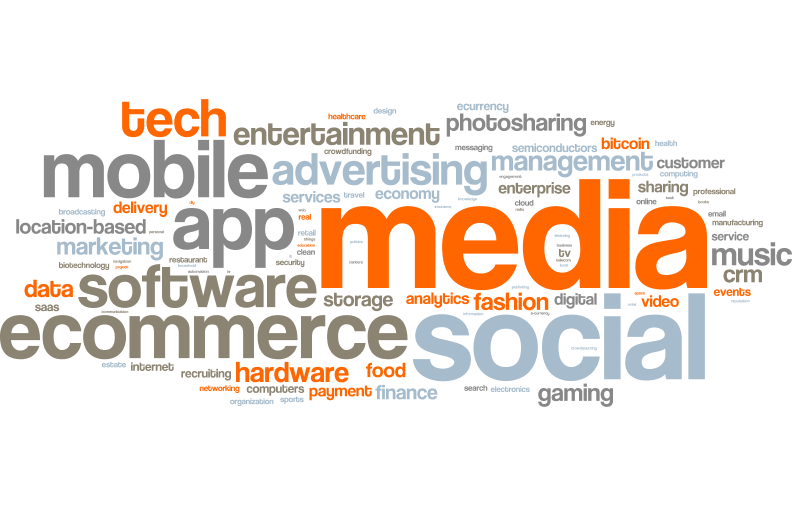 Social media, mobile apps, software, and e-commerce were the most common verticals among the startups we analyzed. Quite a few startups on our list were created in tandem with emerging technologies, such as location-based apps, virtual currency, and cloud storage. It’s no wonder these startups struggled to survive, with so many created at once and oversaturating the market. Some software companies were too caught up in the technical side, which led to customer development issues. Devver, a cloud-based enterprise software tool, “focused on engineering first and customers second,” according to its founder. Social media startups tended to struggle with gaining traction and creating a viable business model. Mobile apps were difficult to turn into a sustainable business. “No clear or predictable way to sustainability” led to the failure of Cusoy, an app that helped people find gluten-free restaurants. Most fashion-focused companies had money issues, either running out of cash or failing to secure funding. Startup postmortems are one part closure for the founder and one part giving back to the startup community. In these personal essays, startup founders analyze what went wrong with their business in hopes that others can learn from their mistakes. Many of the founders doled out similar advice: a solid business model, sufficient funds, and enough market interest are crucial for success. Since most startups are strapped for cash, sinking substantial budget into marketing is not an option. Yet marketing is necessary to get people talking about the startup. Without anyone talking about your startup, it becomes difficult grow. And if you can’t show signs of growth, attracting investors becomes near impossible. 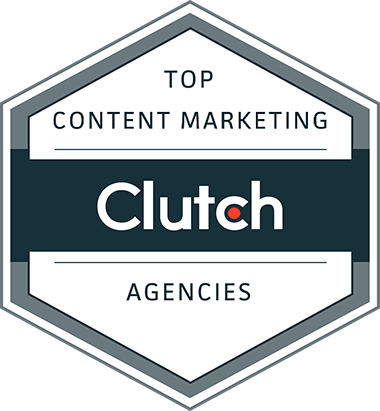 Many startups are turning to content marketing to fuel growth, due to its relative affordability compared with traditional marketing and PR tactics. Better yet, this approach is highly effective. A well-executed, comprehensive content marketing strategy can attract press coverage, improve SEO, and drive traffic to your site – all of which can help startups gain traction. We chose 193 startups for this study based on those with founders who publicly wrote about their failure, or had sufficient media coverage detailing the shutdown. We found many of these startups through CB Insights’ startup postmortems list. From there, we read each postmortem essay or article about the startup and identified the top one through four primary reasons for failure.